You know when you're wearing something uncomfortable: you're acutely aware of the fit, feel, and breathability. You also know when something feels just right—so do your consumers. Comfort is (literally) a plush path to brand loyalty. It’s also a shortcut to disloyalty when you get it wrong. Loyalty is even more powerful in the age of multi-channel shopping—if you make a great impression, customers will seek out your brand, and buy more. It's a simple equation, but it's easier said than done. Many brands don't have the basic textile know-how to maximize comfort. That's because comfort is far more complex than it seems: while the feeling of it is simple, the production of comfort is quite sophisticated. 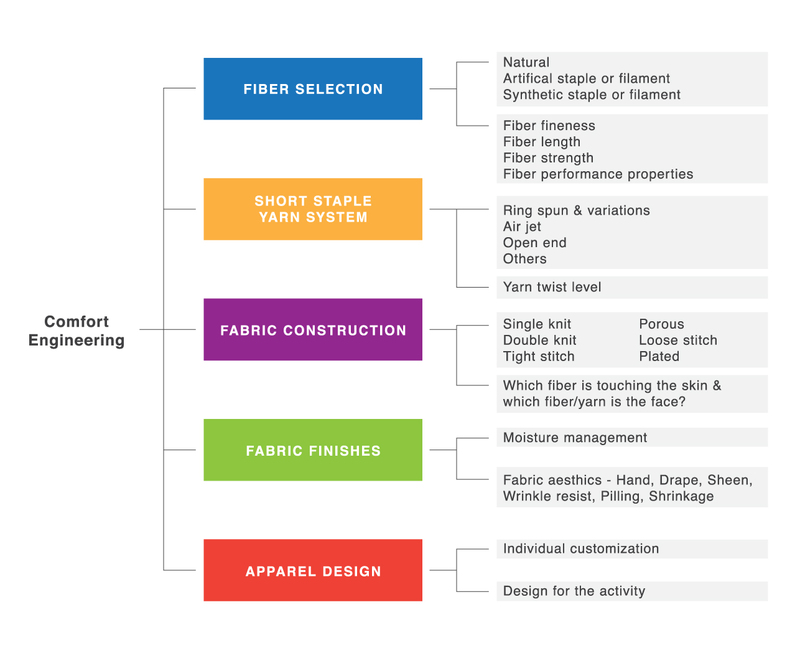 There are multiple elements of comfort (e.g., fit, environment, touch, drape) that contribute to the overall whole—and multiple choices at every stage of production (e.g., fiber, spinning system, yarn structure) that impact those elements. Let's take a closer look at the anatomy of comfort, what variables to control, and how your supply chain comes into play. Fit: Garments can be tight and flexible for activewear, cropped and crisp for formalwear, or loose and relaxed for leisurewear. Environment: Clothes are made with the local climate in mind: different fabrics work better for warm or cold temperatures, and humid or dry environments. Touch: Fabrics can be rough, tough, and abrasive (like wool sweaters or work gear) or silky, smooth, and buttery to the touch. Drape: Garments can fall loosely, sit starchily, and even support, depending on the function and style. Physiology: An individual's body has a major impact on comfort: what might be right for one can be extremely uncomfortable for another. Fortunately, you can control 4/5 of the equation by focusing on variables in your supply chain. Let's see how. While brands are familiar with how the formal design of a garment affects comfort, few are well-versed in the finer points of how fiber properties, spinning systems, yarn profiles, and fabric finishes play a major role in the comfort of the final product. It begins as early as the choice of fiber. Each has different properties, including length, strength, and diameter. Even a small difference at this level may have profound effects on the comfort of your clothes. There's no simple equation for each of these variables: they're all interwoven (pardon the pun). Changing one thing has implications for all the other choices. A longer, stronger, thinner fiber allows you to spin finer yarn with lower twist level to produce a light, breezy fabric with an elegant drape. But a weaker fiber requires additional twists to achieve the same strength, making for thicker yarn and rougher fabric that's more likely to “torque” (skew) over time. Ring spinning improves the feel and drape, but comes at a price, while open-end spinning sacrifices elements of comfort for affordability. If you want to create cold weather wear, you'll want a fabric that insulates well—a yarn with a lower twist level, which creates more bulk. But lower twist means weaker yarn and fabric, so you'll have to choose the right fiber and spinning system to recover that strength. You can see that things get complicated pretty fast. You can easily get a headache trying to puzzle out the exact right combination of fiber, spin, and yarn structure for your desired comfort. That's why it's best to bring in the experts up your supply chain, like Buhler. We understand the materials, mechanics, implications, and possibilities of fabrics far better than any brand. You might not even realize what you can do with the right combination. By allowing every part of the supply chain to contribute to product development and innovation, you can gain a clear competitive advantage. We're here to help you create new, exciting products that sell instead of taking up space—and we're eager to share our expertise. Contact Buhler Yarns today to learn more about what we can create with your brand.